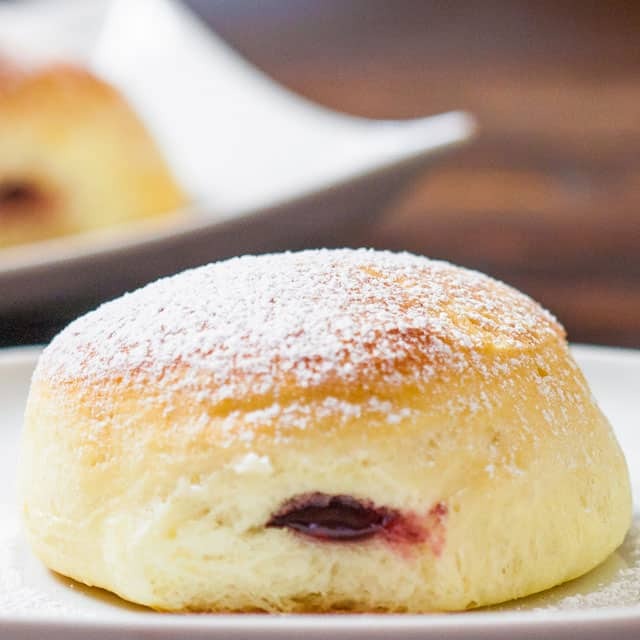 Baked Jelly Filled donuts – now you can have your donut and eat it too. Delicious donuts filled with your favorite jelly and best of all they’re baked! My friends, have I not stuck to my new year’s resolution and bring you healthier dishes so far this year? 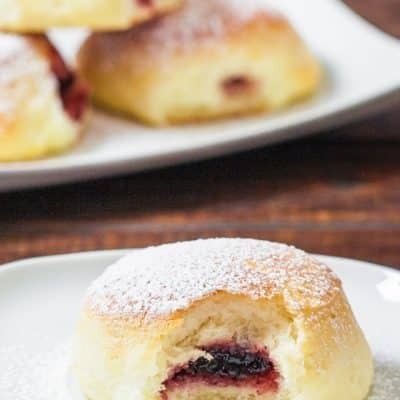 Today I am proud to present you with this fabulous recipe of baked jam filled donuts. I know what you’re thinking, and I won’t lie to you. Yes the fried version is way better, but this version is way healthier. Seriously! With this version you can have your cake, ahem, donut and eat it too. Of course if you were born one of those lucky people that never have to watch their calories, you could always go for the not so healthy version here. Now I want to ask you a serious question? Look at these donuts. Don’t they look spectacular? OK, so you’re probably wondering what the texture is like and what they taste like. They are very light and the dough is quite fluffy, not quite the same as my jam filled buns, this dough is a bit stickier which is what makes them so light. The dough is quite similar to the beignets, you’ll notice the ingredients are the same, just different quantities, so probably if you were to fry these donuts they would taste the same. Now I understand these may not be for everyone, but these are perfect for when you have a sweet tooth but don’t want to kill your diet. So what have you got to lose? 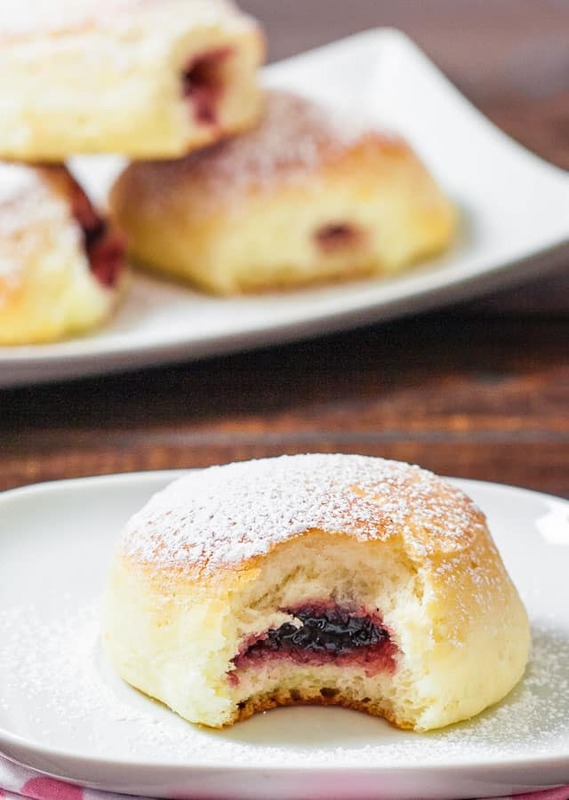 Baked Jelly Filled donuts – now you can have your donut and eat it too. Delicious donuts filled with your favorite jelly and best of all they're baked! In a small bowl, mix the yeast, 1 tsp sugar and 1/4 cup warm water. Set it aside until foamy. In a large mixing bowl, combine the flour, salt and 1/4 cup sugar. Pour in the yeast mixture, melted butter, egg and the milk, use a mixing spoon and keep stirring until everything well-combines, for about 5 minutes. The dough will be super sticky, pretty similar to cake batter. Cover the bowl and let the dough proof until double its size. Prepare and line a baking pan with parchment paper. Since the dough is super-sticky, make sure the work table is well-floured, pour the dough on the table; it would spread out by itself since it's very soft and lumpy. Do not knead or pat it too hard (as it will deflate the air bubbles and your donuts won't be that airy). Pat the dough lightly to about 2 cm. Dip the round cookie cutter with flour first and cut the dough, use a spatula to help you transferring the round dough onto a large baking tray. Cover the dough and let it rest for 20 minutes. Preheat the oven to 375 degree F. Brush the donuts with some melted butter and bake the donuts until lightly brown. It will take about 12 minutes (depends on your oven). Cool the donuts on a rack. Prepare a pipping bag fitted with a long round cake decorating tip. Fill it up with your favorite jam or custard and pipe it into the donuts. Lightly dust it with some powder sugar before serving. Just wanted to know the size or diameter of the cookie cutter. I gave these a try with adding vital wheat gluten and they didn’t seem to rise enough even though I doubled on the milk. If you have any experience with that can you tell me if I should be using more yeast or even more milk or water? Also I am using Whole Wheat flour. Okay so I used 2 tsp of yeast and some more water and it rose like 3 times it’s size. The issue I have is that when it goes into the oven at about 2 cm high the donuts rise while baking and then drop back down when I take them out. How do you avoid this and do yours rise vary high when baking and then drop a little, but still stay high enough? This will always happen with baking, no matter what. As long as your donuts looks similar to the photos then you are okay. The difference between the temperature in the oven vs room temp is big and it’s inevitable that any baked goods will fall a bit as they cool. Yes I understand that they will fall a bit after they come out of the oven. Seems like mine don’t get very high in the oven so when they come out they look more like a cookie (low and wide) although still very soft. I just saw your original comment about vital wheat gluten, we don’t have any experience with that. If the recipe is changed then the results will be different from ours. My only suggestion is that it could’ve been over-proofed. Keep an eye on your dough and use it when it’s double in size. I just made these and they were yummy and soft. I have been looking for a baked donut recipe that I could without a donut pan. Can I prepare the dough ahead at night and bake it in the morning? Thank you. You can I would just oil the dough so it doesn’t dry out and cover it up with plastic wrap. The dough should continue to rise a bit in the fridge. 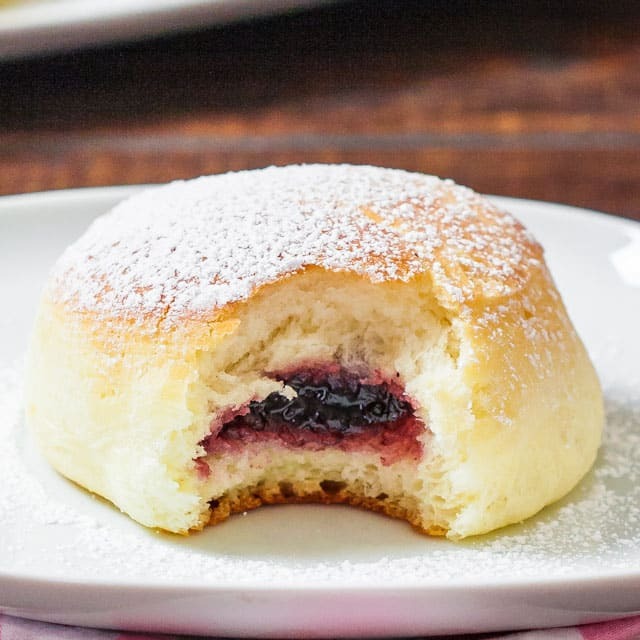 This recipe looked so yummy and I’ve been looking for a healthier version of Krapfen (aka not fried 😀 ). I was just wondering roughly how many donuts the recipe made since your jelly-filled bun recipe was about 2x the flour and made 34 buns. Hi, I just discovered your website and all the yummy food looks great:) When I saw this one I instantly thought about Berliners (I live in Holland next to Germany with capital Berlin;) and they look very similar, love to give these a try! How long should you leave the dough to rise (step 3). Well you should let it rise until it doubles in size as the instructions suggest. I cannot give you a time estimate because it differs all the time, based on your yeast. One option you have, which I recommend with all my recipes of dough that require rising, is to turn on the oven to 200 until it warms up, then turn it off. Place the dough in the oven with the door open, this will speed up the process. But usually it could be anywhere from half hour to even 3 hours. I did it for about an hour and a half. Well worth the wait! Could I use instant yeast instead of active dry yeast? Tried to make this today but the dough is so soft that I can’t even cut it or lift it with the spatula. Have I done something wrong somewhere? Hope you can give me some advise. Thank you! I will try to add more flour next time. Today I ended up using donut pan. Turn out great! I baked these with my daughter. They came out really yummy. Kids loved it. Thank you. Just made these with the addition of some vanilla. They are so beautiful and light. How did you manage to get such even shapes? Mine were a bit messy but tasted great just the same. Will definitely make again. Thank you. I used a cookie cutter and lifted them up with a spatula, doesn’t matter what they look like as long as they taste great. These look so pretty and good. Doesn’t matter if they’re not like fried donuts, I think I’ll love them! These look beyond incredible! So yummy. I do not know why I never would have thought of making at-home filled baked donuts; I mean I own a donut pan now, but did not think of doing this shape. I wonder if I could use this same recipe to make a Boston Cream Donut… now I am in trouble! Oh you totally could, that is a great idea, a healthier boston cream donut! Brilliant! i love jelly doughnuts so i would give these a try!